When one identifies oneself as a blogger that comes with a certain set of characteristics, one of which is the ever present urge for more. Seven perfect red lipsticks¬? Why not add an eighth to really make sure you have that picture perfect shade. Recently I have found myself lusting after skin care more than makeup. I have my easy beauty routine down pat and don’t want for anything. But skin care, gorgeous creams and lotions, astringent toners and luscious masks and serums. Oh I want it all. These are the items currently at the top of my wish list. The Aesop Purifying Cream Cleanser. I was provided with a generous sample of this cleanser the last time I visited Skins Cosmetics in Amsterdam and promptly fell in love with the formula. Gentle and soft but leaving the face perfectly clean. The Oskia Renaissance Mask. I saw Lily and Anna mention this in on of their recent Beauty Chat videos. It supposedly improves the skin and makes it brighter and softer, sounds like a dream to me. The Origins Make A Difference Plus Rejuvenating Treatment. I’ve always struggled finding a night time treatment and sticking with it. I change my moisturizer about four times a week depending what I feel my skin is asking for. 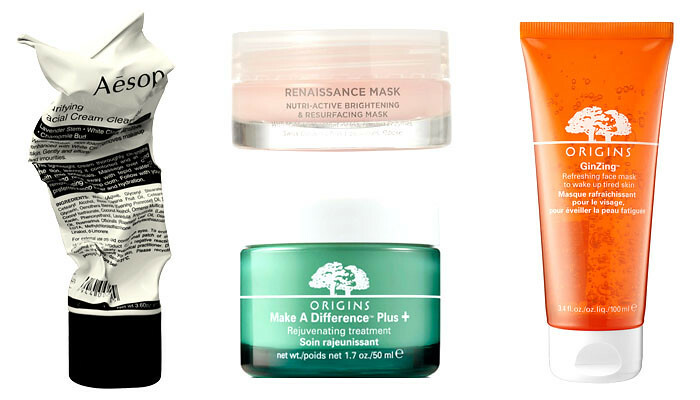 And lastly the Origins GinZing Refreshing Face Mask. Origins is bringing it with their additions to the GinZing line. I already love the moisturizer and the scrub and a refreshing ten minute hydrating treatment sounds like just the thing I should be adding to my collection. Did it work for you? Do I need to just persevere and my skin will get better? Or did you switch because it wasn't working?